Of all the movies for Blumhouse to put their name on. Whether as a marketing tool or a way to distinguish its film from others with the same title, the production company that brought us the great Get Out and the very good Happy Death Day just last year, is flaunting ownership of one of their worst movies. 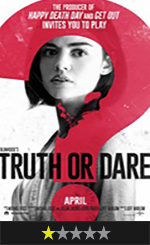 Blumhouse’s Truth or Dare is an excruciatingly bland, scare-and-fun-free exercise that has difficulty conveying even the simplest ideas of its serviceable high concept.